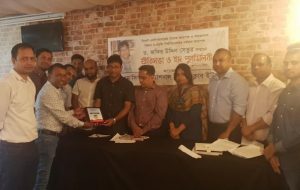 The Reception was held on 25 June 2018, at the Stepney Green Bean and Leaf Café in East London, under the chairmanship of MC International Tourist Club, UK President Tajul Islam. The event was conducted by the Joint-Secretary Imran Mahmud. Dr Rowab Uddin spoke as the chief guest. Special guests who spoke were former Principal of Syedpur Adarsha College and Founder Member of MC ITC Muhammad Shahed Rahman, Former Professor of Jagannathpur Degree College and Founder Member of MC ITC Md. Sajidur Rahman and Shaheda Shimul, lecturer of zoology (College branch) of Sylhet Blue Bird School. Speaking as the chief guest, Dr Rowab Uddin praised the UK MC ITC and said that Dr Zafir Setu, a researcher, powerful poet and a mother language teacher is being honoured in London. The club’s roots are in the MC College of Sylhet. I am glad to be here today at this event. The memory of MC College still stirs our hearts. Dr Zafir Setu is the source of knowledge. With that knowledge he is teaching in enlightening the society. I respect him from my heart and salute him. He added, ‘The youth of today who are here in the UK are giving their skills, intellect to the UK. If their skills & experience could be used by Bangladesh, it would definitely help in implementing the vision of the country. Unfortunately, we could not keep them in the country. This is also our failure, the failure of the state.’ Dr Zafir Setu also remembered MC College fondly and said MC College is our place of dream, place of love. Others who addressed were MC ITC UK Secretary Ajmal Hossain Imran, former secretary of Sylhet MC College Rotaract Club secretary Abdus Sobhan, Jahangir Hossain; Member of Tourist Club of MC College Sylhet Kabir Ahmad, Life, Member of MC ITC UK Mahmud Reza, Babul Ahmed, Abdul Malek, Abdul Hamid Khan Sumed, Md. Abdul Jalil, Abdur Rahman Chowdhury and Murad Chowdhury.